step 2: take one stack of 8 sheets of tissue and fold them accordion style starting along the short end. i did about 1.5-2 inch folds. step 3. cut in half for big flower or thirds for smaller flowers. step 6. fan out and begin lifting one sheet of tissue at a time, till you have a pretty flower. then ohhh and ahhh at your crafty self! step 7. once you have a collection of flowers, begin playing around with an arrangement on the wreath. when it looks good, slather wreath with hot glue and hold flower in place. once it dries there is no moving them so make sure you like it! finish by pinning on ribbon. i pinned a small loop of ribbon on the back to hang it. If you make one I'd love to see pictures!! It really would be super fun for Valentine's Day too. Beautiful wreath. Thanks for the tutorial, hope to make one this weekend, I will let u know how it turns out. Your wreath is so lovely. I will try to make one soon. Thanks for sharing!! This is adorable Tessa! Great tutorial too. 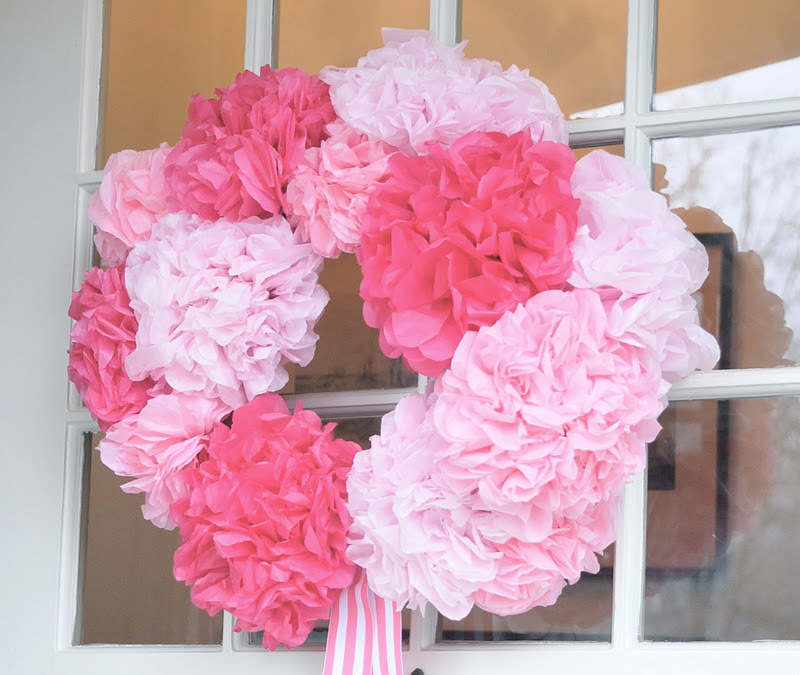 The way you used the pom poms on the wreath is really pretty! I like the extra flair you added with that pink stripe ribbon. What a beautiful greeting for your guests. Oh, the cookies look delicious too! I would love to have a bag of those to enjoy with some tea or coffee. Yum! Tessa, your wreath is gorgeous! I don't know...you look pretty crafty to me. Michaels used to carry a Martha Stewart kit for tissue flowers (really big like beach balls) that we hung under our deck for a birthday party once. Your pretty front door was a much better backdrop than the underside of our old deck though! What a great way to use the paper pom poms - love it!! How fun! Ijust made 4 huge pompoms for annie's birthday party....I wish they were smaller so /i could do this! A trip to Michael's may now be on my to-do list for today! I can't wait to make this wreath! I am having a shower for a former high school student of mine, and her colors are pink and sage. 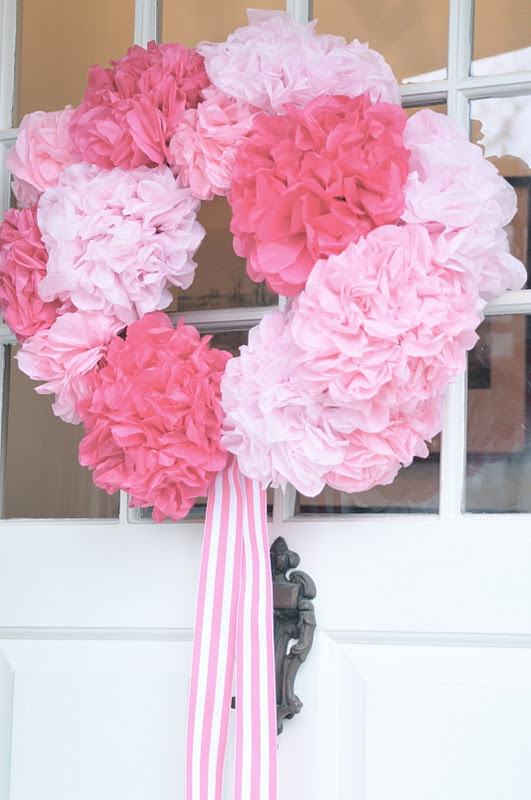 I want this shower to be special and it will now begin as everyone enters my front door with this adorable wreath! Thank you for sharing your idea. I will try to post a picture of my finished product for you to see. Have a simply wonderful day! How sweet I love the pink! This is super adorable!! I love making pom poms, so I will def. have to try this! How does it hold up being on your front door? Found you featured on Fingerprints on the Fridge linky party! Thank you. I made this for a baby shower so it only hung outside for several hours, but it was fine for that time. I gave it to the guest of honor afterwards. She hung it on her door for a few weeks after baby arrived, but hers was protected by a storm door. Hope that helps! Just made this for my daughter's 1st birthday! Turned out so great! Hot pink, light pink, orange and turquoise! Could also stick the excess floral wire (that on the end of the paper) into a straw wreath. Just a thought!